Funding for Restriction Enzymes: A History is made possible by the Genentech Center for the History of Molecular Biology and Biotechnology at Cold Spring Harbor Laboratory. 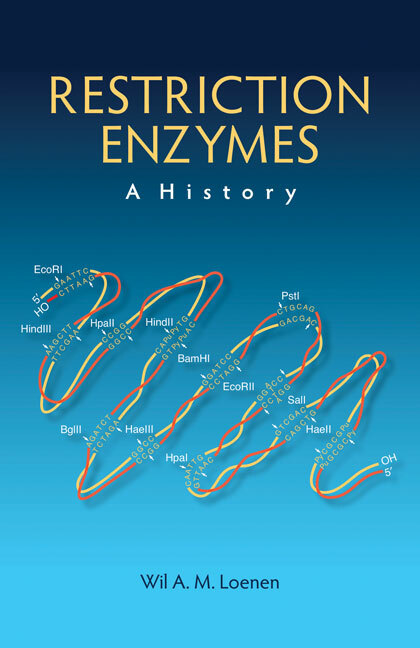 This book is freely available to read online at https://restrictionenzymes.org, or please click here to download it in PDF format. This title is also available for order in print format below. This book by Wil Loenen is the first full-length history of these invaluable tools, from their recognition in the 1950s to the flowering of their development in the 1970s and 1980s to their ubiquitous availability today. Loenen has worked with restriction enzymes throughout her career as a research scientist and came to know many of the leaders in this field personally and professionally. She is the author of several authoritative and widely appreciated reviews of the enzymesâ€™ biology. This book was written with the close assistance of several of the fieldâ€™s pioneers, including Rich Roberts, Stuart Linn, Tom Bickle, Steve Halford, and the late Joe Bertani. The seed for the book was sown at a retirement party for Noreen Murray, to whom the book is dedicated, and its roots lie in a remarkable 2013 conference at Cold Spring Harbor Laboratory that celebrated the people and events that were vital to the field’s development. Funding for the book was made possible by the Genentech Center for the History of Molecular Biology and Biotechnology at Cold Spring Harbor Laboratory. A companion website to the book (www.restrictionenzymes.org) includes an electronic version of the text and ancillary material that is freely accessible to readers.